The San people are bushmen who span multiple countries in Southern Africa. “For millennia, they have lived as hunter-gatherers in the Kalahari desert relying on an intimate knowledge of the environment.” Thus begins Sonja’s story, written with Matthew Parkan. Friend and colleague Sonja Betschart is a fellow co-founder at WeRobotics. In 2015, she teamed up on with partners in Namibia to support their wildlife conservation efforts. 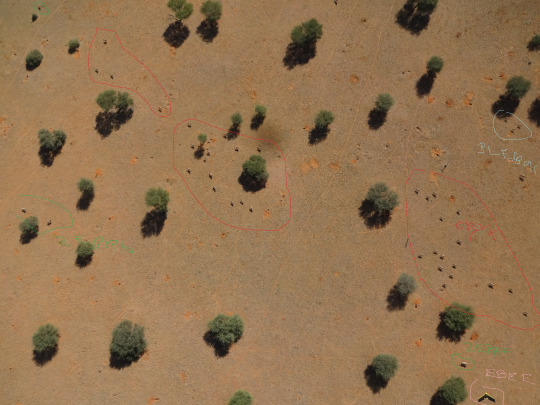 Sonja and team used aerial robots (UAVs) to count the number of wild animals in Kuzikus Wildlife Reserve. All the images in this blog post are credited to Drone Adventures. If that name sounds familiar, it’s because of this digital crowdsourcing project, which I spearheaded with the same Wildlife Reserve back in 2014. The project, which was covered on CNN, used crowdsourcing to identify wild animals in very high-resolution aerial imagery. As Sonja notes, having updated counts for the number of animals in each species is instrumental to nature conservation efforts. While the crowdsourcing project worked rather well to identify the presence of animals, distinguishing between animals is more difficult for “the crowd” even when crowdsourcing is combined with Artificial Intelligence. Local indigenous knowledge is unbeatable, or is it? They decided to put this indigenous technical knowledge to the test: find the baby rhino that had been spotted in the area earlier during the mission. Armed with the latest aerial robotics technology, Sonja and team knew full well that the robots would be stiff—even unfair—competition for the bushmen. After all, the aerial robots could travel much faster and much farther than the fastest bushman in Namibia. Game on: Bushmen vs Robots. Ready, get set, go! As Sonja rightly concluded after the mission, the project in Namibia was yet more evidence that combining indigenous knowledge with modern technology is both an elegant way of keeping this knowledge alive and an effective approach to address some of our technical and scientific limitations. As such, this is precisely the kind of project that Sonja and I want to see WeRobotics launch in 2016. It is fully in line with our mission to democratize the Fourth Industrial Revolution. This entry was posted in Crowdsourcing, Drones/UAVs, Humanitarian Technologies, Robotics and tagged Bushmen, Namibia, Protection, Wildlife. Bookmark the permalink. Incredible. This just shows that technology in the right hands can be even more powerful than we could have ever imagined. This is a great story. I appreciate the author’s humility in recognizing both the limits of the technology and seeing how the traditional knowledge and technology could be combined (rather than a zero sum outcome of only one is better).